Teaching Tim - Tips on Cooking Vinny's Chicken Scarpelli. Tim, my office mate, is the reason I have this blog. One, otherwise uneventful, day in May 2004 he suggested I set up a blog and write restaurant reviews. Maybe he was fed up with hearing me talk about food and suggested the blogging mularky as a way to shut me up. I didn't even know what a blog was back then. Boy, do I know what a blog is now! Even though I blame Tim for heading me down this crazy path, when he recently asked me if I could help learn to cook, how could I refuse? 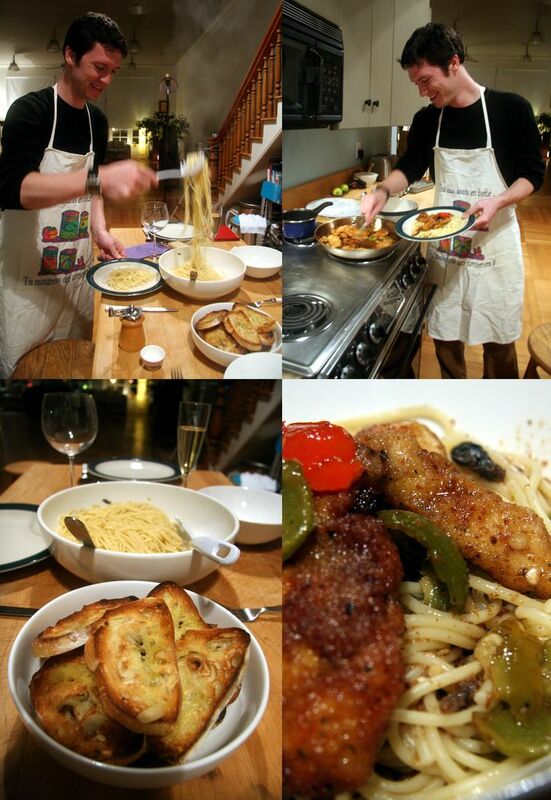 Tim fancied learning a chicken and pasta dish, so we started off by teaching him Vinny's Chicken Scarpelli. Vinny is a friend, of Italian parentage. The Scarpelli is one of our favourite of his dishes. Vinny gave me the tips on how to put this dish together and even came over on the night to help supervise. First, Tim sliced 3 small chicken breasts. 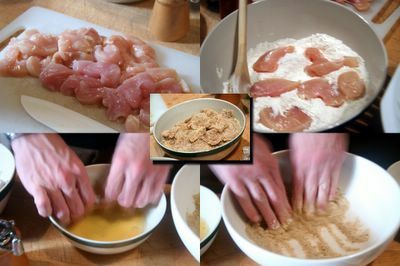 He gently coated the chicken pieces in flour that had been seasoned with salt and pepper. One piece at a time he then dipped the chicken in a beaten egg before generously coating them in Italian Style Bread Crumbs. If the egg starts to run out before you have coated all of your chicken, thin it out with a little water. 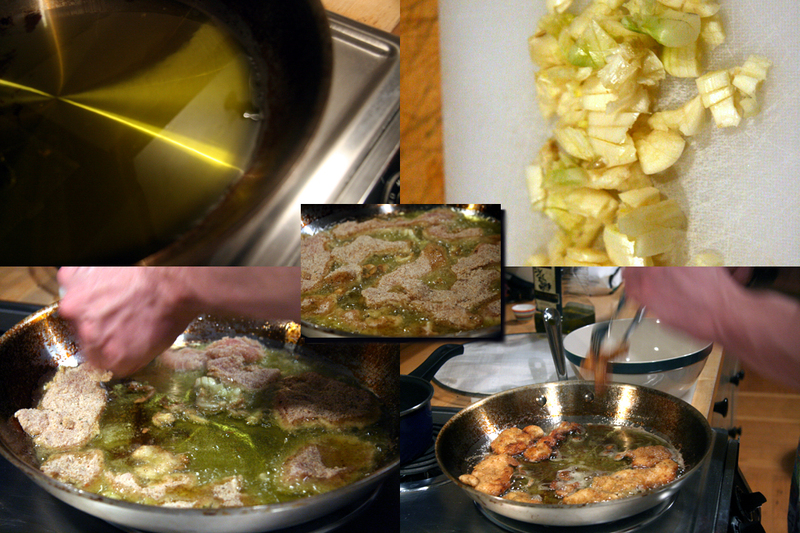 Next Tim heated up a generous amount of olive oil in a large frying pan. He prepared and roughly crushed and sliced some cloves of garlic. Once the oil was hot enough to quickly 'sizzle' a piece of garlic, Tim then carefully added as many of the breaded chicken pieces as he could fit in the pan, together with a generous handful of garlic. He fried the pieces until they were golden brown, turned them over and continued cooking them until crispy on the other side. Once cooked, Tim removed the slices to rest in a bowl whilst he went through the same procedure for the remaining batch of chicken. Meanwhile, a jar of Sweet Cherry Peppers, had been drained, with the vinegar being kept to one side. The seed cores were removed from the peppers which were then roughly torn into pieces. Once the chicken was cooked, the peppers and at least half of the vinegar, more garlic, salt and pepper, were stirred into the olive oil. Tim stirred it well, to mix in all the little left behind bits of fried chicken, garlic and breadcrumbs. On this occasion we used sweet cherry peppers. I think it has a lot more kick and tastes even better with hot cherry peppers instead. When we asked Tim to put two thirds of the spaghetti in the pan of boiling water, we didn't really intend for him to just let the remaining third drop all over the side. At the point Fred, the Pasta King, stepped in to supervise Tim's noodle cooking technique..
Tim serves up. After draining the pasta, a little juice from the pepper pan was stirred into the spaghetti to keep it moist whilst serving. 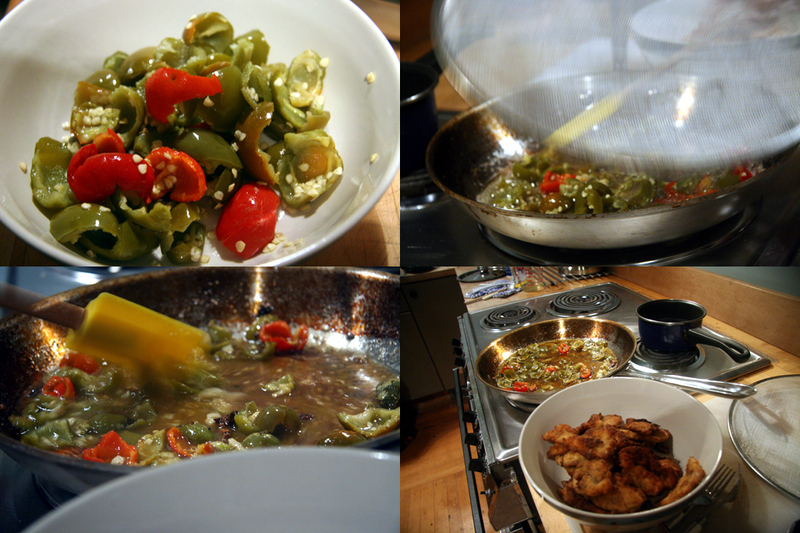 The chicken pieces were stirred into the pepper mixture. Season generously, to taste at this stage. A pile of the spaghetti was then topped with the chicken and pepper mixture and sprinkled with grated Parmesan, if desired. I perked up a stale garlic loaf Tim had bought along by cutting it into slices which placed in a large roasting pan. I dribbled the bread with olive oil and New Maldon sea salt, then left in a hot oven for about 5 minutes. A good looking guy, and now he can cook?!? Bestill my heart. My maiden name is Scarpelli. I've copied this recipe and plan to use it. :-) Like Alice, I never thought to season the oil with garlic before frying in it. Sounds wonderful! Thank you for sharing the recipe and the pictures! that's too funny - I love this dish althiough it isnt the healthiest, perhaps. I will tell my friend Vinny you were inspired.